Whew! I finally have my back porch put together. I think this is the latest I have ever been but it’s ready and that’s one more thing I can check off my list. 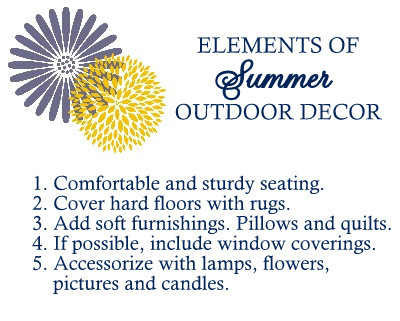 I believe that outdoor decor is just as important as what’s inside. 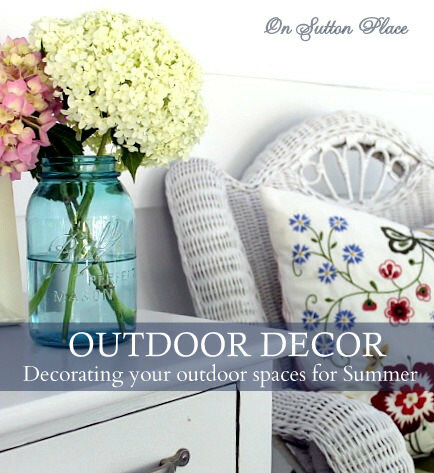 Decorating your outdoor spaces for summer can be fun and it doesn’t have to break the bank. I had an old hutch sort of thing on the far wall. Over the winter the wind knocked it over and it totally fell apart. I couldn’t find just the right thing to replace it so that wall is empty for now. I like to use the same decorating elements outside that I use inside. Since my space is long and narrow, I laid two 5 x 7 rugs end-to-end in order to cover the majority of the cement floor. I added these IKEA pillows to the chairs. I wanted something bigger due to the fact that these wicker chairs aren’t so easy on the back. You just sink into these and it’s actually very comfortable. Pillow fanatic that I am…I added 2 new sets to the little sofa. The striped ones are Ralph Lauren from TJMaxx and the polka dots are pillow covers from IKEA. It might not look like it’s long enough but I can completely stretch out and nap here. Haven’t had the opportunity yet but I tried it out…maybe someday soon! This little chest doesn’t look much different from last year. I switched up the stuff on top a bit and used a few things that were in the now-destroyed hutch. I love to use this space in the evening. With the lamp lit it becomes a cozy, peaceful spot. My new secretary hasn’t gotten off to a very good start. I caught her napping on the job again! This space is small, but in the summer this one extra room makes a difference and extends the indoors out. Thank you for stopping by! Gorgeous touches Ann! What a cozy pretty space you have created! Your porch is beautiful, Ann. I love that it is a covered area as I’m sure that extends the season out there. Blue and white is one of my favourite looks and with the addition of green it looks so fresh. I would have a hard time leaving that space, especially with those squishy looking pillows. It is just perfect and so comfy looking. I am with you decorate outside the same as inside. Then all your pieces can mix and match. I feel a porch needs to look welcoming to guest. I pinned and shared your lovely space on FB. I love your porch, Ann! We are waiting on two new chairs…hopefully will arrive in the next week or so. Then I can finish the porch for Summer 2013. We have had few porch sitting days this Spring with the rain and snow. You have great taste and great ideas! Thanks so much for sharing! I am inspired! Ann, what a lovely place to sit and relax! Your porch is just beautiful! I love the colors that you’ve chosen! So pretty! Hi Ann, I thought you were just busy and were’t posting, here I forgot about you moving to WordPress, I have to go back in your posts and see what I’ve missed! I love your porch so very much,,,looooove the black and white you are using there. You are not even a good seamstress but a fantastic decorator too! Oh my , I adore your back porch!! I could happily sit out there for hours, as I’m sure you could to. :) I will be featuring this at our party tomorrow morning. Stop by and grab a button if you would like. Thanks for sharing with us at Link It Up Thursday. Ann, I could live on your beautiful back porch. It’s so inviting…just makes me want to sit with my feet up and a glass of tea. .Love the blue and white mixed with the green cushions and floral pillows on the chairs., and I think your new secretary has the best seat in the house. Sorry, I haven’t visited for a while. I’ve been having problems finding you. I finally removed you and added you again to my blog roll, but can’t get you to update on my reading list, even though I’ve done the same thing. Not to worry, at least I have you on my sidebar. I’m headed back now to read all the posts I missed. Very nice. I love the blue and green! Thanks for sharing at Creative Things Thursday! Oh, Ann….your porch is so pretty! I love the lime green and navy together. The white looks so crisp, too!!! I see that your office staff is sleeping on the job, however! Your porch is just lovely! That secretary, however, is too darn cute! She knows a great place to nap when she finds one! Ann, your back porch is amazing! It makes me want to paint all my furniture white! I love the crisp elegant look of black and white together! Your secretary is really falling down on the job. I wouldn’t get much work done once I sat on your gorgeous furniture either! You really have a talent for putting everything together so well. Your porch could easily grace a magazine cover. As I read your post I had to smile, as I’ve spent the morning moving furniture and ‘editing’ in our bedroom and in the guest rooms. Everything looks so much airier and more comfortable. Next stop is the veranda, although we haven’t had much sitting-out weather yet this year. How lovely is this! Beautiful! And I dare say your secretary approves! Oh Ann your porch is gorgeous! One of my favs. All your pretty colors just make me smile. Ann, I would be spending all my time here. 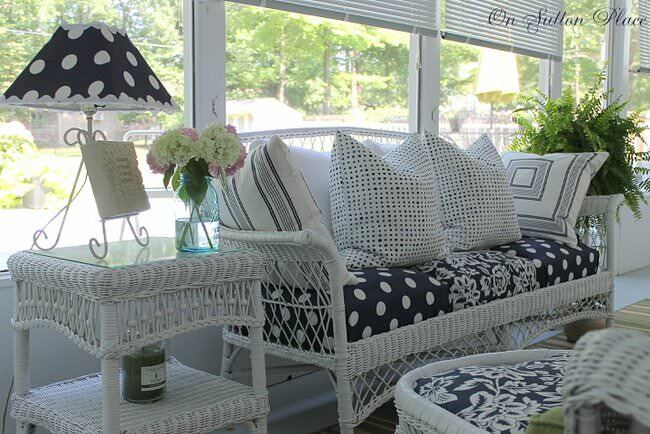 Your porch is beautiful and I love the different fabrics and pillows. Thanks for joining the Open House party. Okay, I want to come sit there and relax and read! 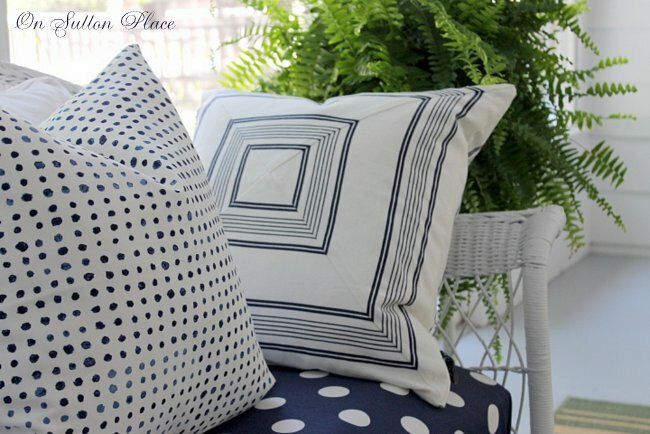 Love the blue and white and the fat pillows! Lovely porch. It’s so inviting. Your porch is so pretty! I love blue and white and you have done it so well with the pops of green. Your porch is BEAUTIFUL! I do not think the pictures make it look packed. . . I would call that cozy! Love the light colors with the touches of blue! Looks like a great place to have my morning coffee! I am your newest follower! Love it, Ann! I love the black and white color scheme you have going on. Your lamps are great! Those pillows do make the wicker chairs look very comfortable to sit in. I’m going to plan for Haven next year. I’ve already put it in my online calendar so I don’t forget this time. What a gorgeous porch! I love the colors, the pillows, the wicker and the plates! You have it all and it’s perfect! Your porch is just darling and I love all the Navy. I will have to head over to TJMaxx and see about finding a rug like yours. The whole space is so put together, and perfectly displayed. Hope you get a chance to relax and enjoy it:) Beautiful space. We’re here at Haven, but I had to come see your porch! It is just awesome, Ann. Just think of all the days stretched ahead of you where you and your secretary can nap when you please. Love that new rug and the new pillows. Ann your porch looks FABULOUS and you took such great shots! Love love all the blue and white! I would have my morning coffee out here all the time! Stunning! It looks so crisp, yet so comfortable too. I don’t blame your secretary for nodding off. Ann, I love the flower pillows you added this year to your adorable porch. The wreath is a perfect touch too. Your porch is so pretty. It looks so comfy and welcoming. I could sit there and read for days. I love your blue/white porch. Did you cover your polka dot cushions yourself? I”d love to find the cushions or the fabric because my cushions on my wicker sofa and loveseat need replacing. Ann your porch is fabulous! The colors really grab the eye and it’s laid out beautifully! 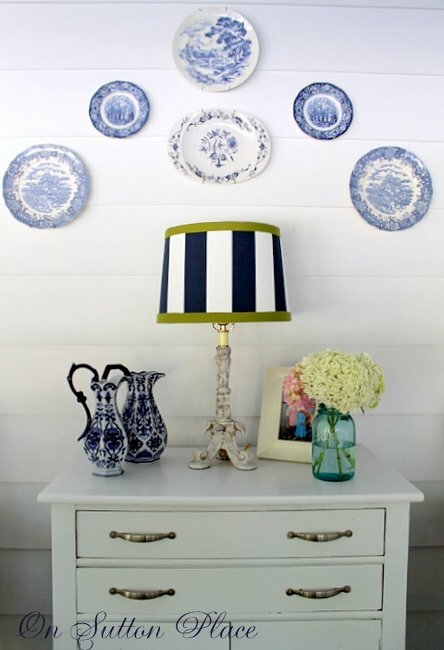 The navy and white is so striking and the lamp shade is perfect! Perhaps one of those metal baker’s racks might work for the spot where the other piece fell apart? 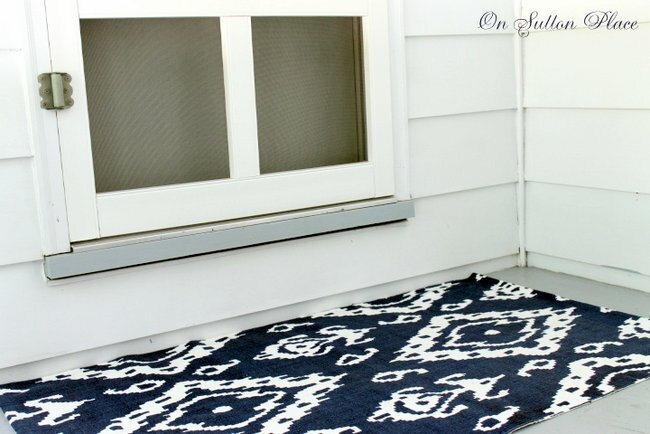 I hope you can find your rug- i love that kind of Ikat pattern. I’d be out there relaxing as much as I could! Gotta do it!! Your secretary is good at napping! 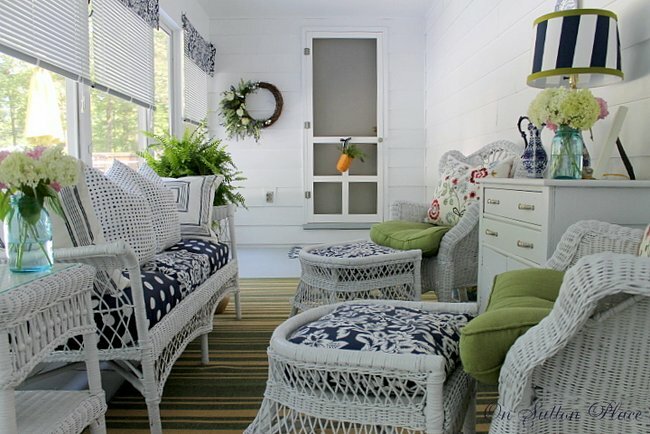 Ann your porch is gorgeous, I love the wicker furniture and those pretty pillows. I would be happy to sit there all day! Your secretary is the cutest one I’ve ever seen. Your porch as adorable! Looks like a lovely place to read a book or have a glass of iced tea and relax. I like the polka dot cushions with the striped pillows! Thanks for sharing. Your porch is just gorgeous! I’ve always loved a white, lime, and black color scheme! It looks so comfortable and inviting… and yourlittle one is so at home taking a snooze! She is a beautiful animal! Such a pretty porch! I love the blue and white. A very summery porch! 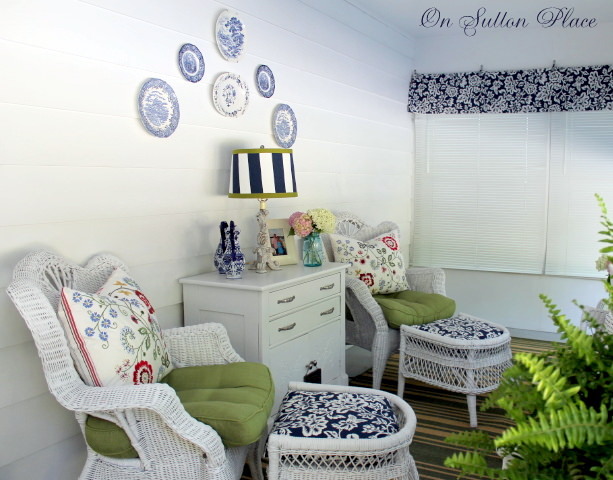 Love the blue, white and green on your porch–just lovely! Ann…so pretty….I could spend days on that porch! 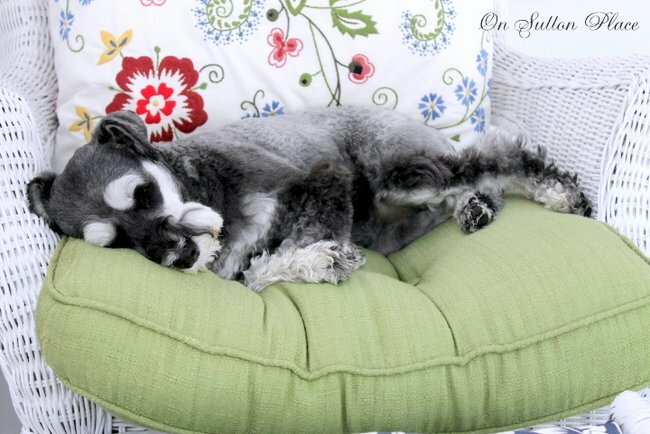 Love the back porch…I think I need to visit TJ Maxx a little more often! Enjoy the sunshine! Oh Ann. When I win millions I want to hire you to decorate all of my houses, lol. Beautiful!! I LOVE your porch, Ann! It’s truly a wonderful extension of your gorgeous home. 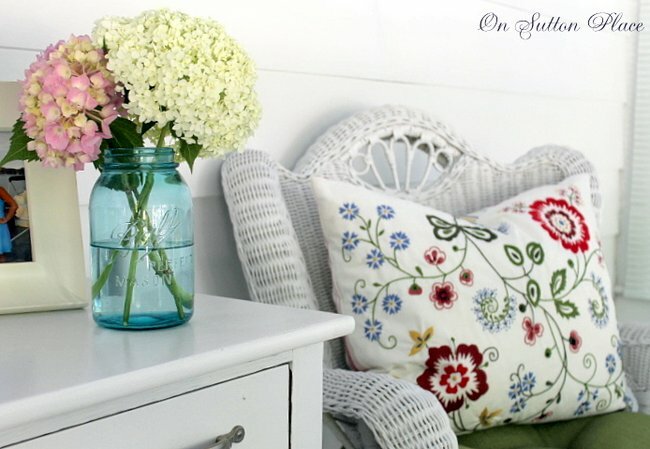 Your choice of fabrics is fantastic … love your IKEA pillows (I have the same ones) … and your vignettes are inspiring! Your furry baby looks right at home.